Peter Japsen, senior research scientist, dr.scient. Peter Japsen has worked with many aspects of geology and geophysics: seismic mapping, depth conversion, estimation of overpressure and exhumation ('uplift') from sonic data as well as rock physics of chalk and basalt. Geographically, these studies cover Scandinavia and the North Sea, Greenland and Brazil. Burial and exhumation history of NE Brazil with partners from Geotrack International, University of Rennes, Statoil do Brasil, Petrobras and the Geological Survey of Brazil (CPRM). 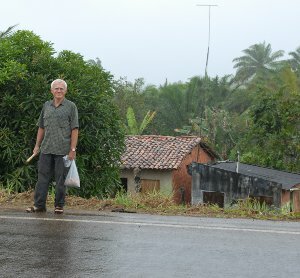 Fieldwork in Brazil in 2007, 2009 and 2011. Several studies concerning the burial and exhumation history of the Greenland margins; including studies aimed at understanding the interplay between mountain building and the development of the Greenland Ice Sheet. Fieldwork in East Greenland in 2009 and 2010. A study of the processes driving the sharp drop in chalk porosity at high effective stress (the North Sea chalk compaction front). Collaboration with partners at the institute for Physics of Geological Processes (PGP) at University of Oslo. Investigation of the history of burial, uplift and exhumation in Scandinavia and the Baltic area. These studies are based on integration of results from landform analysis, apatite fission-track analysis data, sonic data from offshore wells and the stratigraphic record. Earth and Planetary Science Letters, Highly Cited Author 2006 – 2010 for the paper "Elevated, passive continental margins: Long-term highs or Neogene uplifts? New evidence from West Greenland"